Are you a new mom? Just starting post-secondary school? Recovering from drug or alcohol addiction? Recently lost your job? Going through a divorce? Dealing with chronic pain or a chronic illness? Suffering from the loss of a loved one? This list goes on and on of the types of situations people find themselves in that can lead to feelings of low mood, worry, and stress. But, with the right type of mental health supports – if received in a timely fashion – people can learn skills to help them better manage symptoms of anxiety and depression. The Canadian Mental Health Association (CMHA) is pleased to offer a new program to Ontarians called BounceBack®. Following the launch of It’s Never Okay: An Action Plan to Stop Sexual Violence and Harassment three years ago, on March 1st 2018 Ontario launched It’s Never Okay: Ontario’s Gender-Based Violence Strategy as the next big step towards ending gender-based violence in all its forms. The new framework will designate up to $242-million and builds on the important work already underway through the Domestic Violence Action Plan, It’s Never Okay: An Action Plan to Stop Sexual Violence and Harassment, Walking Together: Ontario’s Long-Term Strategy to End Violence Against Indigenous Women and Ontario’s Strategy to End Human Trafficking. November and December are important months for raising awareness of gender-based violence around the world. December 6th National Day of Remembrance and Action on Violence Against Women marks the anniversary of 14 young women who lost their lives at l’Ecole Polytechnique de Montreal, simply because they were women. 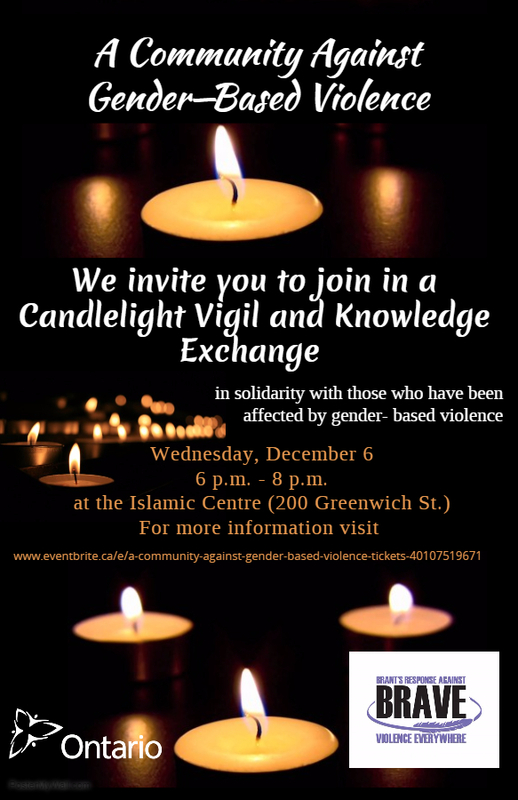 The BRAVE Committee invites you to join in a Candlelight Vigil and Knowledge Exchange in solidarity with those who have been affected by gender-based violence. This event also coincides with The 16 days of Activism Against Gender-Based Violence which begins on the International Day for the Elimination of Violence Against Women (November 25th) and ends on International Human Rights Day (December 10th).